FTS001 is the first in a new series of split 12″s, conceived to bring complementary and contrasting styles from two artists onto one disc. FTS001 sees an experimental veteran go side to side with one of Portland, Oregon’s best kept secrets. On FTS001, K. Leimer plunges us into a tranquil meditation, delighting the head and the heart with warm details, plucked from expansive generative compositions and carefully arranged across four tracks with a deft and knowing hand. Conversely, listening to Like a Villain’s composition for the Split Series is like allowing someone to take your heart between their thumb and forefinger – excitement, pleasure, fear and pleading. In this piece she rips through her own pristine melodies like a hurricane, relentlessly and remorselessly circling back again and again until all prettiness is returned to noise. Released by First Terrace Records, London. 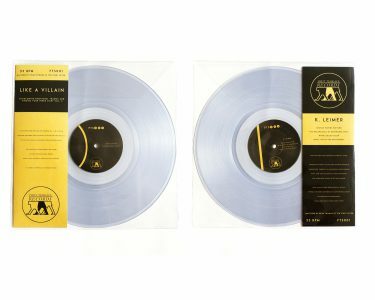 Clear Vinyl. Limited Edition.